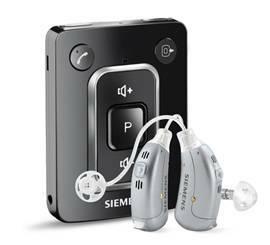 The touch of a button can link you to a superb listening experience with Siemens Minitek. The Minitek is an automatic streamer that can wirelessly connect your high-tech audio devices with your hearing aid. This pocket device can beam audio from any Bluetooth, e2e or T-coil systems directly into your ears. You can also hook up the device to any non-wireless gadgets via the USB port. The Minitek can stream audio continuously for 5 hours. It also functions like a remote control to adjust volume, answer calls, etc.